This AI-powered platform was created to automate this monotonous process and optimize the sales pipeline to generate more leads and, in effect, bring more revenue. Fortuna.ai, a Toronto-based company, has developed a product that uses artificial intelligence to find leads, contact them, and follow them up periodically, as well as handle objections or requests for information until the prospect shows interest and is handed over to the sales team to close the deal. To analyse responses from leads, the platform uses natural language processing or, more precisely, natural language understanding. 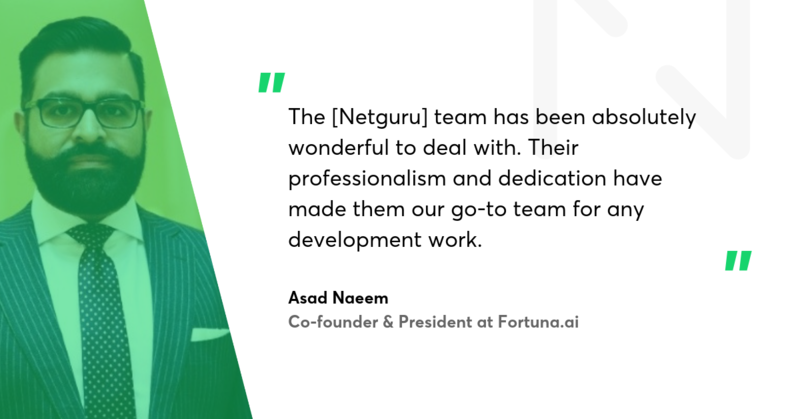 Netguru’s Python developers helped the company with some of the product’s features and today I spoke to Asad Naeem, co-founder and president at Fortuna.ai, about the product, the main challenges in the Machine Learning-powered business, and plans for the future. Can you describe in a few words what Fortuna does? We do sales process automation that accelerates sales cycles. More precisely, we help companies find their ideal clients and automate the top half of the sales funnel, which is finding the clients and then figuring out if they're qualified for your business or not. The current status is that the human has to do all of these. They have to spend time finding prospects, figuring out how to contact them, then contacting them and going back and forth. With Fortuna.ai’s technology it's persistent. The virtual assistant just keeps going back and forth to the prospect, learning from the responses and leading a conversation until it gets a “yes” or a hard “no”. It saves a lot of time and makes sure that the company is spending the human capital in the right spots. Sales people are spending 80 percent of their time doing low value activities. We automate the entire process so sales people can spend more time being account managers and concentrate on sales rather than the low-value, daily, mundane churn that leads to morale deficiency or burnout. Let's say a company was at a six month sales cycle before. With our tool it can shave a couple months off, because the initial activities such as finding the the right type of clients and making sure that they're qualified gets compressed in a very short time frame. Can you tell us what is underneath the surface? How the AI algorithms work? Since we are specialized in financial services, we know what type of questions come up, what are the qualification questions that that clients will ask, what type of answers they're looking for, and what moves them down the sales pipeline. We also get playbooks from companies to see how they've done it in the past and what has got them the most success. Then we can replicate that in the language that the bot uses. The algorithm will know answers to the frequently asked questions and specific information that our clients are looking for. The magic there is also that if the bot doesn't understand something, or if the client asks something that is not within the league of what the bot is capable of doing, it can immediately hand it off to a human agent. There's nobody out there that focuses on a very narrow niche. Ours is financial services. My partner and I have experience in this industry, so we are able to better serve the market. Our chatbot is trained on existing datasets that are very specific to our niche. Thanks to that our solution is all automated, rather than some of the other solutions out there which are more template-based or based on Human-in-the-Loop systems. Where exactly do you use machine learning? There's machine learning involved in two spots. One is the actual prospect identification. If any financial services companies share their transactional data with their existing clients, you can build statistical models to explain what type of client it is, what is the demographic, the age group, the job title, the schools they went to and so on – it's a full analysis on their current client database. Once we have that, we can start going out and looking for these individuals. We're able to feed the algorithm with names of the companies and then we can get contact information for these people. The other half of machine learning is involved on the chatbot side. We use natural language processing, NLU essentially, for the actual communication with prospects. I can understand that the chatbot learns with that process, so the more conversations with a client you have, the more precise the chatbot is in future conversations. Do you plan to expand to different industries as well? Not right now. My business partner and I come from the financial services world, where identifying clients and communicating with them is not like the general sale type. Finances are very specialized, and so is the language sales reps use in the industry. That's where our edge is. At what stage is the company? In terms of actual stage of the business, we are now in the growth phase. We have grown from a two-person team a year ago to ten people now. We have been revenue positive since the day one. We have three offices now: one in Toronto, Canada, one in San Antonio, Texas and one in Lahore, Pakistan. We've also moved way beyond what we were initially doing. We use the automated chatbot that does all the notifications for us. Where do you target your product? We do North America, Australia and then we're just starting to go into the UK a little bit. We want to finalize our expansion there by the end of this year. What are the biggest challenges at the moment? With the UK I'm sure you are well aware of the GDPR implications. That's giving us a very difficult time, but we're slowly getting to the stage where we can say confidently that we are going to be fully GDPR-compliant. We have to, as the consequences of not being GDPR-compliant are not good. We're just going to dip our toes in with the UK market and see if that goes well. Obviously, mainland Europe is definitely in the plans, but that's a little bit later on. What are the plans for the next year? Where do you see the company at the end of 2019? In terms of the company itself, we are hoping to be fully expanded out into Australia and the UK markets. We're hoping to be wrapping up our sales efforts in North America, where we're trying to double-digit grow our revenue from now on into the next year. In terms of personnel, we're looking at between 20 and 25 people as as a company. In terms of financing, we're hoping to raise our official seed round. Probably in February or March. So those are some of the milestones for the next months.